When a series of energy waves travelling at a certain frequency encounter a moving object, they are reflected back to the source at a different frequency. This change, the Doppler shift, is proportional to the velocity of the moving object. In its clinical application a transducer emits an ultrasound beam of either a pulsed or a continuous wave pattern that reflects off body tissue, e.g. red blood cells. Through a series of mathematical algorithms, we are able to determine the patency of a blood vessel by measuring the velocity of the blood flowing within it. When combined with a sphygmomanometer, we can determine the pressure in an artery at a specific point. From this, we can determine if the vessel is diseased and estimate the significance of any impediment to flow. A diode on a very small transducer transmits an infrared beam of light into the underlying subcutaneous tissue. Backscatter from red blood cells is received by another diode in the transducer. The signal is processed to produce a waveform on a chart recorder. The PPG records changes in blood volume that correlates well with intravenous and intra-arterial pressure studies. In venous disease, a change in the PPG waveform indicates the presence of obstruction and or incompetence. 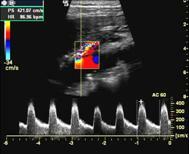 In arterial disease, PPG assists in assessing blood flow when calf arteries are calcified. In these instances PPG toe pressures more accurately reflect foot perfusion as the microcirculation of the toe is usually not affected by calcification. 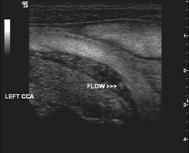 A probe transmits multiple sweeps of pulsed ultrasound beams that reflect off underlying tissue interfaces that affect these soundwaves in varying ways. Some are absorbed, some pass through and some are reflected back at various angles. Because the delay time is proportional to the distance from the transducer, it is possible to convert the returning signals into points along the beam axis. Computer grey scale processing allows for the allocation of brightness intensity proportional to the echo signal strength. This information is displayed in a position that corresponds to its anatomical origin providing us with dynamic anatomical information. Duplex imaging (B-Mode combined with PD) is the most common form of ultrasound used in any vascular facility. 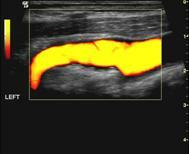 A high-resolution image of the anatomical structures is combined with Doppler data to calculate blood velocities at selective points, within a specified vessel. In arterial disease, changes to these velocities are usually proportional to changes in lumen size (narrowing) and cardiac output. We can determine velocity changes (usually an increase), which indicates the severity of the disease. In venous disease, we can target specific veins to determine if they are patent and if there is reflux. Real-time, colour-coded flow information is superimposed over the B-mode image using varying hues and brightness to indicate relative average frequency shifts and hence velocities. This allows for an immediate interpretation of blood velocities at any point throughout the vessel lumen and, with the aid of computer filters, helps to determine sites of significant disease. The addition of CDI has reduced the time required to perform the study and helps produce a more accurate result by acting as a guide to the location of blood vessels while at the same time indicating the patency and the significance of any visible disease. This technology displays moving blood rouleaux incorporated into the B-mode image and is not an overlay like other dynamic modalities. It is the most sophisticated form of ultrasound for assessing blood flow as it does not obscure anatomy and is extremely sensitive. As blood velocity increases, there is an increase in the return Doppler signal and in high flow states there is aggregation of white point return echoes. Where there is a region of low blood flow, there is a low signal and, as little or no information is displayed, the area appears dark grey to black. A form of CDI, PDI exploits the total power of the Doppler signal to produce real-time colour-coded flow. This technique is more sensitive than conventional CDI and is extremely useful for assessing low-flow situations. However, PDI is only able to determine that flow is present and does not provide any information related to velocity changes or flow direction.